Who doesn’t dream of having a slim and shapely body? All those women with extra fat on their hips, arms and thighs, and those tyres around their waists have surely tried innumerable easy, and difficult, ways to shed that stubborn fat, and found it still there. Don’t lose heart. There is still an easy way out. Sounds interesting, doesn’t it? So read on and find out. Easy way of accommodating exercise in your daily schedule. By “easy” way, I mean fitting the exercise schedules into hard work-load. Normally one has to keep aside those precious 20 minutes every day for exercising, sometimes, even more. And after those workouts, you are tired, hungry and wondering why the extra fat doesn’t disappear. One thing to make clear is that without exercise and a controlled diet, it is impossible to have that slim appearance. Don’t fool yourself by starving one day and eating for 2 the next! This does more harm than good. You won’t lose weight. And crash diets (beware) are absolutely lethal for your skin. To begin, you will have to start right from the time you wake up. Don’t jump out of the bed. Give yourself 5 minutes and simply s..t..r..e..t..c..h... Your arms, legs, back, as slowly as you can. Feel completely relaxed. There should be no tension in your body. Flex your fingers and wiggle your toes. Feel the blood course through your limbs. Feels good, doesn’t it? Then get up to brush your teeth. Lean over the basin and tuck in your tummy as you brush. The correct posture is to stand with legs slightly apart, one hand on the hip as you brush with the other. Take your time and brush thoroughly. All the while, hold your stomach in and believe it or not, this is one exercise that works. And you did not realise it all this time? Add a teaspoon of honey and the juice of half a lemon to half a cup of warm water. Drink it slowly first thing in the morning. It does wonders for your complexion and also helps you lose excess fat. Making the morning tea can also be a form of exercise. Keep your cups and saucers on the top shelf and sugar, tea, etc, at the very bottom. When you reach up, stand on your toes and reach up to your full height. Use both your arms. Again when you bend, tuck your tummy in and bend completely. Of course, never do pick up anything heavy when bending over. You are sure to strain your back. In fact, use your kitchen for your reaching up and touching toes exercise when doing your chores. You will not feel that you are exercising in the dull drab way. Next, making beds is a wonderful form of exercise. Plump out the pillows, dust out the sheets, and tuck the edges properly. Bend and straighten. You will find you are using so many muscles of your body including the ones in your stomach, thighs, arms, back and hips. Do it as a normal chore. And always try to tuck your stomach in. After some days you will find that you are holding your stomach in naturally without feeling the strain. During the day, use your body muscles as you finish chore after chore. If you have a staircase, use it as many times as you can. Keep a few things upstairs so that you have to climb those stairs. Sounds crazy with today’s labour-saving devices, doesn’t it? But, if you want to become slim and trim, you will have to think differently and restructure your attitude. It’s the only healthy and normal way to do it without visiting clinics and eating special “diet” foods. Also read SimpleExercises for homemakers. Regarding diet, change it as follows. Do it gradually, especially if you are feeling unwell or hungry most of the time. If you have health problems or high blood pressure, or any other ailment, do consult your doctor before you change your diet. Also read Dieting: Common Myths and Facts. Your morning cup of tea (or coffee) should be light and add very little of sugar, if you cannot do without it! Better switch to a healthier option such as green tea, but if you cannot, at least make it less sugary and preferably avoid adding milk to your tea as it makes it acidic. Between 7 am and 8 am is normally the morning rush hour with tiffins being packed and children rushing off to school and husband to office. Are you sick and tired of slimming diets and backbreaking exercises which don’t make you lose weight? Here’s a fun regimen just for you. See them off and have your breakfast after they leave. It is better because you won’t be in a hurry and be tempted to eat more. Hep yourself with a wholesome nutritious breakfast as mentioned earlier. Eat slowly, chew thoroughly and consider you are having a feast. Be mindful while eating. Remember mental conditioning goes a long way when you have it cut down on your food. Read Dieting: Mind control is essential. 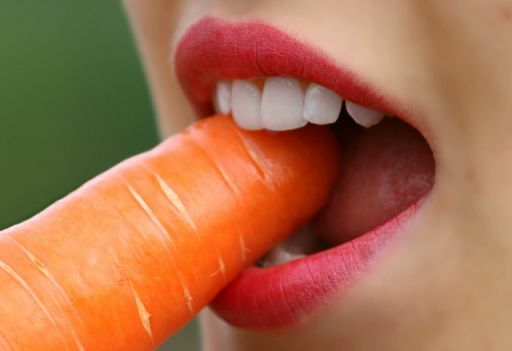 Chew a carrot if you feel hungry in between meals. Even a cucumber is very good as a substitute for snack as it is low-calorie and full of vital nutrients. Mid-morning, help yourself to a chilled glass of thinned “lassi” without any added sugar. Sip it slowly. Tastes great and it’s not that fattening. Munch a cucumber or a carrot when you feel hungry. Skip out the salty pickles and papads. Use smaller plates for serving and do lessen the quantity of rice. Avoid the dessert. Also read Smart eating for weight-loss . Take some rest in the afternoon. Relax in bed with a book or listen to some music. A nap in the afternoon is a great way to rejuvenate yourself and it has its own health benefits but make it a 15-20 minute affair. Do read Benefits of a noon-time nap. Sleeping for long hours in the afternoon is an unhealthy practice and also affects your night-time sleep. Evening tea should be light accompanied by some light health snack – no fried foods or bakery products. Preferably switch to green tea or some other herbal tea in the evening. Read Te(a)rifficfacts about your favourite teas. Walking is a great form of exercising. Do read about the benefitsof walking. Why not walk a bit every evening? If you have your own garden or if there is a park nearby- very good. Walk (a little briskly) for about 15-20 minutes. If you live in a flat, use your terrace or balcony for the walking. And don’t forget to tuck your tummy in. Of course, you won’t. You are getting used to it now. Encourage your family to skip out the evening snack. Instead, go for an early dinner. Around 7:30 to 8 pm is the best time. Start with a soup. Your plate should have plenty of steamed vegetables, salad and daal. Limit your rotis to 2. Remember it is always better to leave the table a little hungry. After dinner, it’s the best time for the family to be together. You can use it for whatever you think best – playing a game, listening to music, watching TV. Let your meal get digested a bit. Before bedtime, if anyone is hungry, (it may include you), have a glass of warm milk. It helps induces sleep. Do read the post Milk for health and beauty. When it’s time to go to bed, let your body come into its own rhythm. Lie down, keep your arms at your sides, and stretch your legs together straight down. RELAX. Mentally and physically. Take deep breaths. Shut your eyes. Let your body go limp slowly. You can feel the peace and warmth seeping into your being. Stay in that position for about 10 minutes. Sleep will slowly engulf you and you will sleep very well. Also read: How sleep affects your weight. Keep this schedule for at least 1 month and see the difference. Look in the mirror. “Wow! Is that really me?” You’ll wonder. You can feel you have slimmed down. Your clothes and your mirror will be the testimony. Don’t keep weighing yourself to corroborate it. Weight loss, correspondingly, may not be all that much. And don’t give up after a month of this schedule. These are not the exercises one would do in a gym. Instead, you fit them in with your daily household work to become your way of life. You didn’t even notice that you were doing them all day, did you? Knowing subconsciously you were going to be slim, you were smiling and cheerful! So good luck! Be slim and stay trim!